There are several skin problems that affect beef cattle. All of these conditions can be treated successfully if detected early. Proper management and prevention is necessary to reduce the problem from recurring or spreading to the rest of the herd. It is best to consult your veterinarian before treating the animals for any condition. This fungal infection occurs most commonly in winter. It is contagious and spreads from calf to calf directly or by calves rubbing against the same post. Symptoms include loss of hair in 1 to 2 inch wide circles. The exposed skin is usually crusty or scaly. Ringworm generally clears up on its own in spring. But if you do treat the ringworm, be sure to wear gloves because ringworm is also contagious for people. Additionally, thoroughly wash your hands after handling affected animals. Warts are skin growths caused by a papilloma virus. They affect calves and yearlings more than adult beef cattle; mature cattle have usually developed some resistance to the virus. Warts appear as hairless lesions, which can be transmitted by direct contact. They generally appear on the neck and shoulder region. The most common types of cattle warts are squat, pendulated, tags and flat. If the warts grow large enough, the cattle can develop secondary infections from rubbing at the warts. Fortunately, warts are more a physical problem than a medical one because the warts usually shrink and go away within a few months. Lice are active in winter and can build up in large numbers on beef cattle. Signs of lice infestation include scratching, rubbing or biting at the infected area. Consult your veterinarian for which product will most effectively kill the lice. Because lice are either biting lice or sucking lice, different secondary conditions may arise. 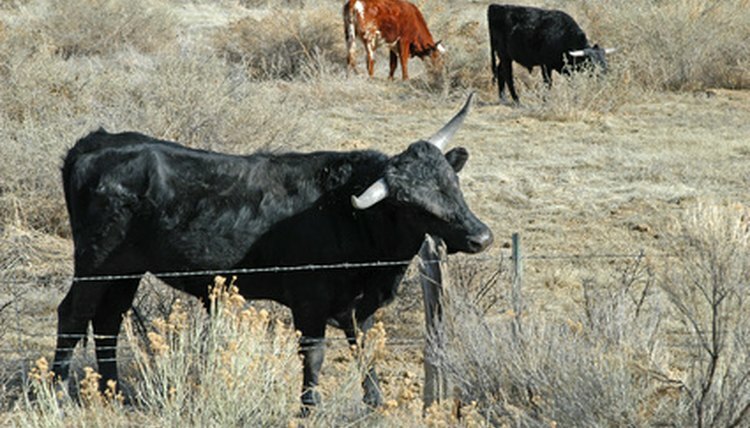 A severe infestation of sucking lice can cause beef cattle to become emaciated due to a loss of blood. Chewing lice can cause secondary bacterial infections which will also need to be treated. Products that rid the beef cattle of lice are available in powder or liquid form. If using a powder, be sure not to breathe in the dust as you apply it to the animal. Wear gloves with either product to protect your skin. Cattle grubs, also called warbles, sometimes appear under the skin on the backs of cattle in late winter or early spring. The grub is the maggot stage of the heel fly. This fly lays its eggs on the lower part of the legs of cattle during the warm days of summer. The grub travels through the body to the animal’s back. The beef cattle may exhibit a variety of symptoms, including marble like welts under the hide, running wildly with their tails in the air, crashing into fences and standing in water holes to rid themselves of the flies. Mange is an intensely itchy skin disease caused by tiny spider-like insects called mites. Mites live on the surface of the skin or tunnel a few millimeters beneath the skin. Females deposit eggs in burrows or beneath scabs. Eggs hatch in about four days. Mites reach maturity soon thereafter and live only one to two weeks. There are several species of mites; sarcoptic mites, psoriatic mites and charioted mites.